I’m a millennial, age 29, former St. Helena school board member, and fourth generation Deer Park resident. Last December, concerned residents circulated recall petitions against St. Helena’s mayor, Alan Galbraith. During the recall campaign, I heard recall opponents repeat the same false narrative. They said, St. Helena’s economic situation is dire and therefore, because it generates municipal revenue, hyper-development is justified. This ruse is an economic Shock Doctrine tactic that global capitalists and neo-liberal politicians have used for decades to justify corporate privatization and austerity measures in nations throughout the Global South. Now, Napa Valley’s hospitality capitalists and neo-liberal politicians are using the same tactics here, etching away St. Helena’s historic slow growth policies and rural character. Unless St. Helena residents openly challenge these capital interests, to change their political trajectory, our local-oriented small town will be lost, forever. Shock Doctrine, according to Naomi Klein’s book, “The Shock Doctrine: The Rise of Disaster Capitalism”, is a strategy, developed by “free market” economist Milton Friedman, whereby global capitalists and neo-liberal politicians use crises, manufactured or natural, to justify privatizing public resource, cutting social services, and gutting environmental and blue-collar worker protections. 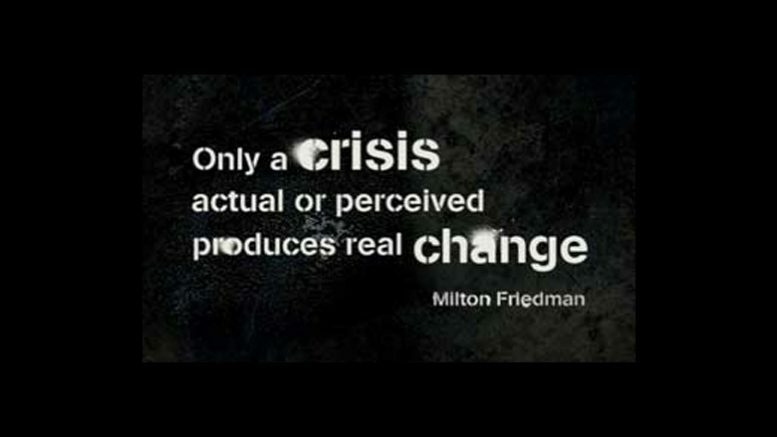 During a natural disaster or economic downturn, politicians use crisis to distract the public while they steamroll devastating free market reforms; They’ll often evoke the rhetoric of economic crisis itself to defend themselves. Academic economic elites, e.g. Friedman and his gang of Chicago Boys, used nations throughout the Global South, as socio-politico-economic laboratories, to test their neo-liberal policies. Chile, on Sept. 11, 1973, is an early example. Democratically elected socialist president Salvador Allende was overthrown by a bloody USA backed military coup. Pincohet, a military general turned brutal dictator, hugely influenced by Friedman, was installed by the CIA. They used the ensuing post-coup crisis, which triggered social end economic turmoil, to axe social spending for poor people, transfer public assets to the private sector, and eliminate trade barriers for global corporations. Post-fire Napa County finds itself under prime conditions for exploitation by shock doctrinaires. Before recent wildfires ravaged Napa Valley, the 2014 South Napa earthquake was the largest Bay Area quake, 6.0 on the moment magnitude scale, to hit since the 1989 Loma Prieta. According to Stanford University and Public Policy Institute of California researchers, in 2011 Napa County had the second highest poverty rate, due to living and healthcare costs, in California. Under dual crises of natural disasters and enormous economic inequality, hospitality capitalists and local neo-liberal politicians are spinning economic narratives, similar to narratives spun in Chile and elsewhere, to support corporatized hyper-development; St. Helena provides a case in point. St. Helena’s budget, due to a $1.9 million unauthorized FEMA payment and $1.5 million deficit in 2015-2016 fiscal year, is still in dire shape. Therefore, because commercial development generates municipal revenue, it’s necessary to promote hyper-development to dig St. Helena out of its fiduciary hole. When juxtaposed to St. Helena’s financial facts, this false narrative reduces to a ruse. For starters, St. Helena has generated more revenue, around $13 million, than both Yountville ($10.5 million) and Calistoga ($11.2 million.) St. Helena’s General Fund has a 30 percent reserve, more than the 15-20 percent recommended by last year’s financial diagnostic. Furthermore, St. Helena proactively tackles its financial situation via the Measure D sales tax, adding $1.2-$1.4 million to the budget. Measure T will also provide $600,000 per year for road improvements. And, the Los Alcobas Transient-Occupancy-Tax adds another over $1 million, annually. St. Helena is achieving, in real time, its budgetary upswing without solely relying on commercial development. Mayor Galbraith’s next town hall will be on February 3, from 11:00 a.m. to 2:00 p.m., at the American Legion Hall. Through these town halls, St. Helena’s residents steer the political discourse to focus on issues impacting them, e.g. rising rents and water rates, fiscal oversight, and commercialization of our small rural town. St. Helena has reached a tipping point, being balanced between two and a half of her City Council. St. Helena’s residents, the people, have a historic opportunity to change their political trajectory, reclaiming the city’s destiny for themselves; not for the investor class, their political partners, or the one percent.